An international conference on establishment of the Afghanistan-Turkmenistan-Azerbaijan-Georgia-Turkey transport corridor, also called Lapis-Lazuli, was held at the tourist zone “Avaza” on the Turkmen coast of the Caspian Sea. The forum brought together heads of transport departments of the countries through which the corridor route runs. 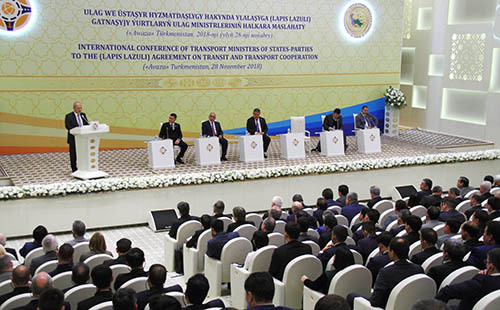 Speaking at the conference, the representatives of Turkmenistan, Azerbaijan, Afghanistan, Georgia and Turkey noted that boosting transport cooperation contributes to the greater involvement of the regional countries in the world trade processes. The conference highlighted the role of Turkmenistan that in recent years has invested billions in the development of the transport sector. The conference concluded with the signing of the final declaration that reflects the key vectors of the transport cooperation between the Lapis-Lazuli transport corridor participating countries.